Describes the characteristics of a Clock Domain identified by the clockDomainID attribute. Indicates that this AVData Entity is driving the Clock Domain. Used to indicate the Clock Domain Reference Clock frequency (in Hz.). Can optionally be used by AVData Streaming interfaces to indicate the reference frequency from which the actual operating frequency is derived. - The actual operating frequency is indicated by the Video- or AudioFrame clock element of the Stream configuration hierarchy. - The actual operating clock and the Reference Clock are always synchronous. - If omitted, then the actual operating clock and the Reference Clock shall be identical. Mandatory for AVData Entities (excluding AVData Streaming interfaces) that act as a Clock Domain Source. Describes the connector through which the clock signal enters the AVFunction. Only allowed for AVData Entities (excluding AVData Streaming interfaces) that act as a Clock Domain Source and receive their Reference Clock through an external connector. Used to indicate whether the AVData Entity is currently receiving a valid clock signal. Used to enable a wider variation in sampling frequency without losing lock. Only allowed when the associated clock recovery circuitry is Adaptive. 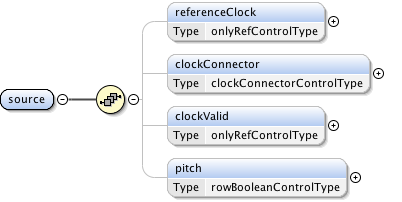 Indicates that this AVData Entity is driven by the Clock Domain.